Secretary, Ministry of Drinking Water and Sanitation (DW&S), Govt of India, Parameswaran Iyer appreciated the leadership of Khandu for successful implementation of Swachh Bharat Mission in Arunachal Pradesh, which is set to become the next open defecation free state. 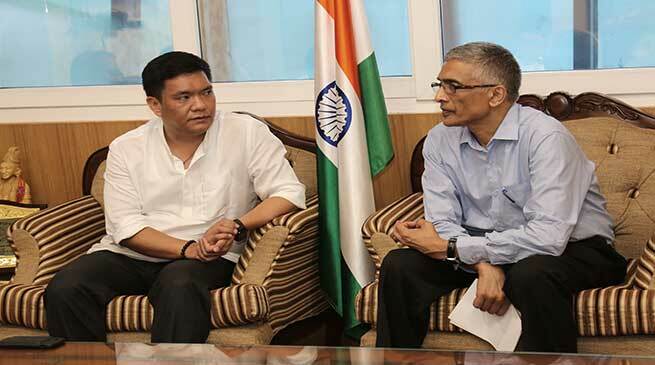 He called on Chief Minister Pema Khandu today and appreciated the state government for achieving open defecation free (ODF) by 87% in the state and opined that the state could achieve 100% target by 31st December 2017. The Chief Minister while acknowledging that deputy commissioners in various districts has been working hard to achieve the target of ODF, also encouraged them to play more pro-active role. He emphasised on use of twin pit technology with indigenous touch for toilet construction as it is cost-effective and environment friendly. The Chief Minister urged the DW&S Secretary to support information, education and communication (IEC) in the state that would be aimed at achieving ODF target. The Chief Minister also urged for fund support through CSR component from PSUs, on which the Secretary assured to conduct a meeting within two weeks comprising of DONER Minister, MoS Home Minister, NHPC CMD and State Minister for PHED. The Secretary informed that if the PHED department can perform well then it can avail more funds from the centre beyond its earmarked allocation. He also assured to help the state avail multilateral fund for successful implementation of Swachh Bharat Mission in the state. To provide technical and management support for achieving ODF, the Secretary assured to depute ‘Preraks’ in all districts, who will work with the deputy commissioners. Currently eight districts have ‘Preraks’, who are professionals deputed under the Swachh Bharat Mission and Tata Trusts to eliminate ODF in rural India. The Secretary requested the CM for revised baseline data on insanitary and defunct latrine to convert it into sanitary latrine through funds from CSR component. PHED Minister Bamang Felix informed that under the CM’s Swachh Mission, the state government has enhanced the fund for Individual House Hold Latrine (IHHL) from Rs 12000 to Rs 20000 per unit. The increase of fund for IHHL has enable people to construct decent toilets, he added.